"A trunk apiece for the four of us, since we've decided to go along." Big-budget Oscar�-winners always make good targets for a satire, and Michael Todd's widescreen extravaganza Around the World in 80 Days is no exception. 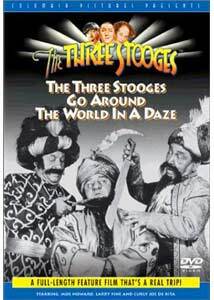 As their next-to-last feature-length film, the Three Stooges (with Joe DeRita, or Curly-Joe, as the third Stooge) slap that epic around and poke Jules Verne's classic novel in the eyes. The Stooges are the servants to Phileas Fogg III (Jay Sheffield), great-great-grandson of Verne's world traveler. Con man Vickers Cavendish (Peter Forster), aided by sidekick Filch (Walter Burke), connives a scheme to not only take Fogg to the cleaners, but frame him for a bank robbery at the same time. Fogg is provoked by Cavendish into repeating his forefather's round-the-world feat with a twist: he may not spend a farthing doing so. Of course, the Stooges must come along and end up saving the day for Fogg more than once. Along the way, they rescue the predictable love interest, Amelia Carter of Council Bluffs, Iowa, while getting into one scrape after another (including a sumo ring and a harem) and attempting to evade Crotchet (Maurice Dallimore), the pursuing Scotland Yard inspector. It's kind of hard to watch the elderly Stooges getting physical with one another, though that business is kept fairly minimal. The eye pokes are gone, there are half a dozen slaps and several dozen head conks (most of them in a few lengthy bursts). Where the physicality of the Stooges is limited, they pick up the slack a bit in the verbal area, with the wordplay being the comic highlights of the picture. One entertaining conceit for devoted fans of the boys is the resurrection of the ancient Pop Goes the Weasel gag from the second official Three Stooges short, Punch Drunks (1934). It's used to good effect, and Joe DeRita brings back much of the appealing naïveté of Curly. The ostensible leads, Sheffield and Freeman, come across as utterly vanilla and have zero chemistry of any kind. Forster is an acceptable over-the-top villain, though longtime character actor Walter Burke as Filch is a good deal more entertaining. Perennial Stooges foil Emil Sitka has a brief cameo in the finale. Mercifully, there aren't any songs. The satire is weak, and the film resorts to the same gimmick ending as the original book and film without adding a twist or cleverness of its own. In any event, for a late Stooges feature, this one isn't half bad. It's not a classic by any means, but there are at least a few laughs and the Stooges aren't shoved into the background as happens far too often in the features. Image Transfer Review: Though the print is fairly clean (except for some badly damaged stock footage), there is very heavy grain. This didn't transfer well and gives the screen a rather sparkly appearance at times. Black levels are moderately strong, and textures are acceptable. Scenes in the Maharajah's palace are rather soft and lacking in detail, as if they came from a later generation source. A film this grainy really should have been transferred as an RSDL disc to allow a higher bit rate. Audio Transfer Review: The sound is adequate at best. There is some hiss and noise present throughout. Dialogue is generally clear enough, however, and the music sounds decent without being tinny, albeit without much low range sound. A few segments are very poorly looped, but that appears to be a fault of the original film, not of the transfer. Extras Review: The sole extras are trailers for three alleged comedies, completely unrelated to the Stooges. Beverly Hills Ninja only gets a full-frame trailer, while See No Evil, Hear No Evil merits only a nonanamorphic widescreen trailer. Rob Schneider's The Animal somehow gets the sole anamorphic trailer here. Doesn't a trailer for the feature exist? And has Columbia stopped adding bonus shorts to its Stooge features? It sure looks that way, because there's none here. A passable exercise for the late Stooges, but not a great transfer. Don't be looking for a bonus short this time around, because there isn't one.